Back from India with a good case of reverse culture shock. It’s not fun, I feel like hiding in a closet for about a month, besides which I have a horrible cold from breathing the recycled air of 500+ hacking, sneezing people for 18 hours flying over 2.5 continents and an ocean. But I’m already planning my 7th trip so stay tuned for details — I have already booked March 11-15, 2013 at the Krishnamacharya Yoga Mandiram to bring people for private classes — 5 minimum, 8 maximum. Let me know if you’re interested because after that week I am planning to teach a yoga retreat in Varkala, Kerala. Throwing it out to the Universe and we’ll see what gets thrown back. My yoga trainings were amazing. I completed Modules 1 and 2 of Ganesh Mohan’s yoga therapy training and because he’s such an amazing teacher that combines the best of East and West modalities, I’ve decided to complete all his modules. I will take Module 3 here then return to India next year for Module 4. The course at KYM, “Discover Yoga Anatomy”, was equally amazing. After going to KYM since 2005, the senior teachers know me and I can no longer hide in class — I get called on now! The course drained my brain because it definitely was an “advanced” training. For example, we had a course on “Yoga Anatomy in the Classical Texts”, a course where we discussed various aspects of Chapter 3 of the Sutra-s (among other texts). 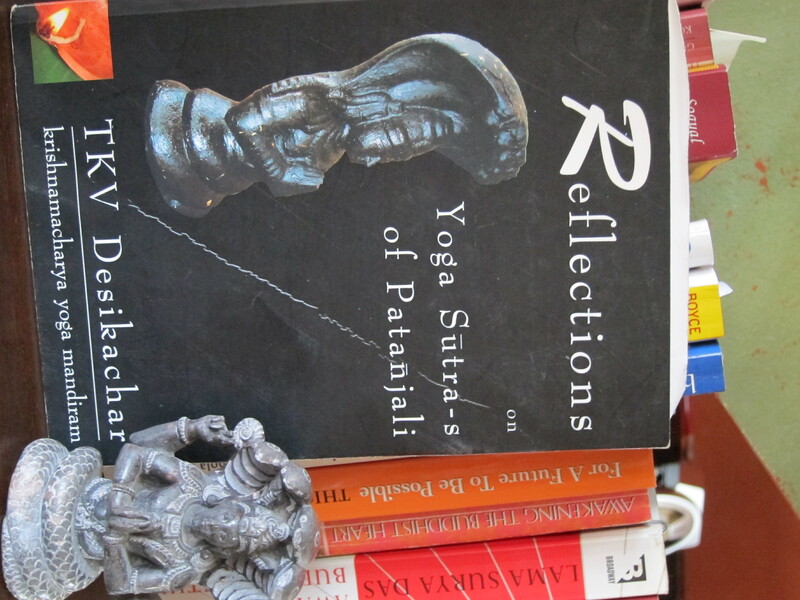 We tore apart YS 3.26-27-28: what was Patanjali really speaking to? Do you take what he said literally or is the north star a metaphoric reference? Where is the north star in our body, what does it represent? Loved it — yoga more than skin deep. I feel grateful and blessed to have been introduced to the Krishnamacharya lineage via Srivatsa Ramaswami when I first started teaching — it is both an honor and responsibility to be a representative of this tradition. SRI GURUBHYO NAMAH. Yoga more than skin deep, beyond asana… what a concept. I realized in India that the more I study in this lineage, the more I am a yoga freak at home. A stranger in a yoga strange land. As hippies were called “freaks” back in the day, I feel even more so like a yoga freak now. It contributes immensely to my reverse culture shock. I was happy to be in India when the John Friend story broke and was amused by all the blahblahblah about it. I spoke with a KYM teacher about what is called yoga in America and she just shook her head. In Kerala I was offered a house and garden to convert into “Sama’s Yoga Garden” — “you could do whatever you wanted, let me get that house cleaned up for you, Shakti”, as a new friend called me and reminded me of my essence, daily. Sigh. I could have stayed for at least three more months. A teaching in attachment and letting go. I saw for the first time in 6 trips that I could very well split my time equally during the year between India and here. Yes, it is possible because it feels so right in spite of Ma India’s warts — my trip started out a bit rough, but I eventually realized it was me, not India. Another teaching on having no expectations and letting it all go. I think once I learned that, that set up the scenario for the rest of my trip, things I experienced and who was brought into my life. Serendipity is a wonderful thing. I actually cut my trip short, changing my flight to return 9 days earlier. I was supposed to end my trip in Varanasi but one day I had a major epiphany that I don’t need to go there because everything that is there in that holy city is already inside me. Stop searching. Just. Stop. “You know your dharma,” the Voice told me. Shut up and do your practice. That was one lesson Bharat Ma taught me on this trip….know your dharma. “Do your best and let the rest go” was something Ganesh told us. It became my new mantra. And as it turned out, I received an email from someone who has offered to help me find a place to bring yoga to the underserved. My dharma. We’ll see what transpires. Things happen when you let it all go. As I said, we shall see what the Universe decides to throw back at me. Ganesh’s delightful father, A.G. Mohan, came to talk to us twice and Kausthub Desikchar gave us two lectures. I took lots of notes and will blog about their talks. But for right now, this yoga freak is getting back into my closet. Hugger Mugger sent me the Earth Elements Mat to road-test in India. I wanted a thin travel mat that could hold up to my sweaty hands and I am happy to report that it fit the bill. I thought it would be problematic because when I first started to use it my hands were sliding. But the longer I used it, the surface “roughed up” a bit after which I had no problems whatsoever (and I was in weather that was over 90 degrees every day and very humid….with daily power cuts so no AC, no fans.) I have the 3mm mat and although it is thin, it still cushions my bones. It is thin enough to fold up and put inside a backpack for traveling, which I did more than a few times. It is so light you can hold it with one finger. If you want a great travel mat without paying a huge amount, check out this mat. It gets a ringing endorsement from Metta Yoga, as did their Sattva Jute Mat I used last year. Next Post who’s afraid of the big bad guru? back in the U.S.S.AAAAA . . . . Thank you for this post. I’m not likely to ever make it to Bharat Ma. I’ll have to practice where I am, in this driven-to-distraction-oh-look-there’s-something-shiny country of ours. And having you blog on your India trips could help. I’m thinking that we need a yoga that doesn’t require withdrawal. Can we find a practice that will loosen the bonds of ego in the midst of all the me me me? I know you might not want to readjust, but I hope you won’t stay too long in your closet. I want to hear what you have to say. I’ve been keeping your posts marked as “unread” in my RSS feed until I had some time to sit down and read them properly. I hope the transition back to the weird western world has smoothed a little more for you now. I’ve missed your pithy comments, dear! hugs!